I looooove granola, but I feel like the ones we buy in the store are so full of sugar, and are SO expensive. So I decided to attempt my own, and I have to say, I’m pretty happy with the results! It’s not nearly as sweet, and has a great nutty flavor overall. I don’t know about you, but when something is so sweet, it’s easy to overeat it. 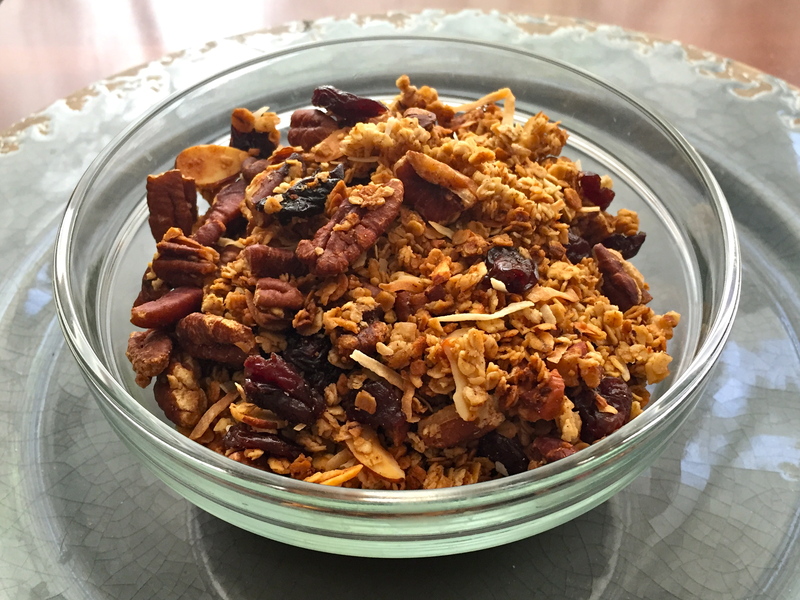 So here you go, my homemade granola! extra add ins once it’s cooled: shredded coconut (add halfway through baking for toasted coconut), dried fruit, chocolate chips, and just about anything else you can think of. 1. Preheat oven to 350 degrees, and line a rimmed baking sheet with parchment paper or silicone liners. 2. In a large bowl, combine oats, nuts, cinnamon, and salt. Add in oil, syrup, and vanilla and mix until everything is coated. Pour mixture out onto your prepared pan. 3. Bake for 10 minutes, then stir. Bake for another 8-10. Remove from the oven and let it cool completely before breaking it into pieces. Once it’s cool, add in anything else you’d like, such as dried fruit, chocolate chips, etc. Enjoy!! I love this with a good greek yogurt. Happy summering!